Pantoea agglomerans is a ubiquitous bacterial strain. It is not an obligate infectious agent of human diseases, but rather, it causes opportunistic infections. Opportunistic infections of P. agglomerans are rare and mainly occur in humans with open wounds and, as hospital-acquired infections, mostly in immunocompromised individuals. More uncommonly, P. agglomerans causes skin infections in humans. This bacterium is a useful adjunct in the treatment of dermatologic and nondermatologic human diseases such as hyperlipidemia, gastric ulcer, melanoma, and atopic dermatitis. Some strains of the bacteria are associated with the production of antibiotics. We present the case of a patient with generalized erythematous papules and vesicles accompanied by systemic symptoms who was finally diagnosed with P. agglomerans cutaneous infection after prolonged trial of multiple treatment regimens. 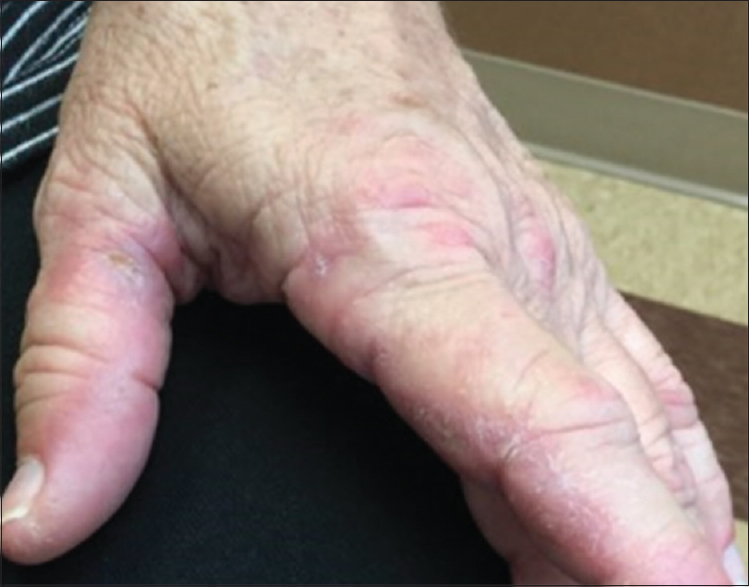 A 62-year-old woman presented with a 3-week history of rash distributed across her face, arms, legs, and hands associated with joint pain and fever. The patient reported a history of herpes simplex virus (HSV), with the most recent outbreak 3 weeks prior, and was treated with oral famciclovir. Treatment with prednisone resulted in some relief of the joint pain, but the skin lesions persisted. The patient stated that the rash was red and painful, at 6 out of 10 on a numeric pain scale. The patient denied sore throat and reported that she was not currently receiving any medical treatment. The patient reported not being a farmer by occupation, but she occasionally did vegetable gardening and yard work involving pine straw. On physical examination, red, tender, 4–6-mm vesicles were found on the arms, face, legs, and antecubital skin [Figure 1] and [Figure 2]. Laboratory tests performed included complete blood count (CBC) with auto-differential, antinuclear antibody (ANA) titer, and hepatic function panel. A shave biopsy of the vesicle located in the metacarpophalangeal joint of the left dorsal index finger was performed. 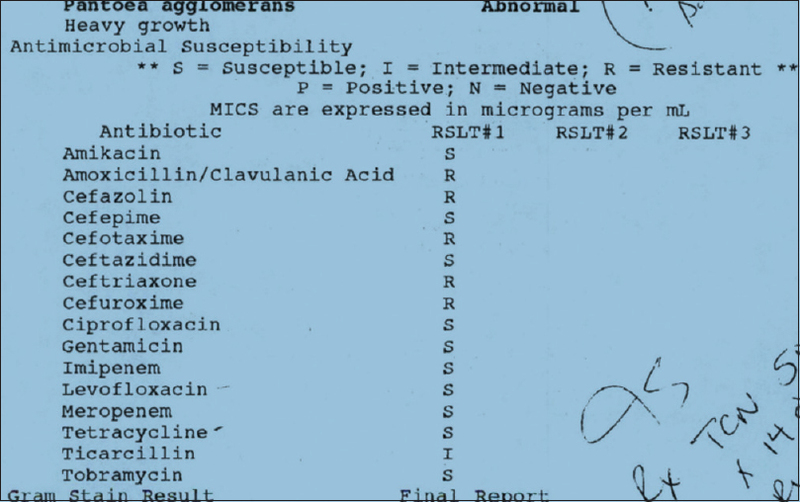 The pathology report showed an acral vesicle suspicious for a viral process [Figure 3]. The pathologist noted that specific findings of herpes simplex, varicella zoster, and parapoxviruses were absent. ANA was negative, and CBC and hepatic panel were within normal ranges. On follow-up appointment, the lesions persisted and the patient reported finding that her puppy had fleas on its body about 2 weeks prior. The patient was given a working diagnosis of insect bites and prescribed halobetasol propionate lotion 0.05% to be applied to affected areas twice daily. A punch biopsy was done on the lesions on the skin of the right dorsal middle metacarpophalangeal joint and the left proximal palmar index finger. The clinical differential diagnosis included erythema multiforme, cutaneous lupus, and dermatomyositis. 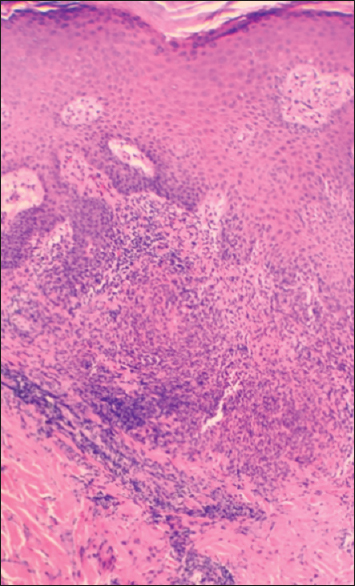 Biopsy of the right dorsal finger showed a dense lichenoid granulomatous dermatitis [Figure 4]. A periodic acid–Schiff stain was negative for fungal hyphae. 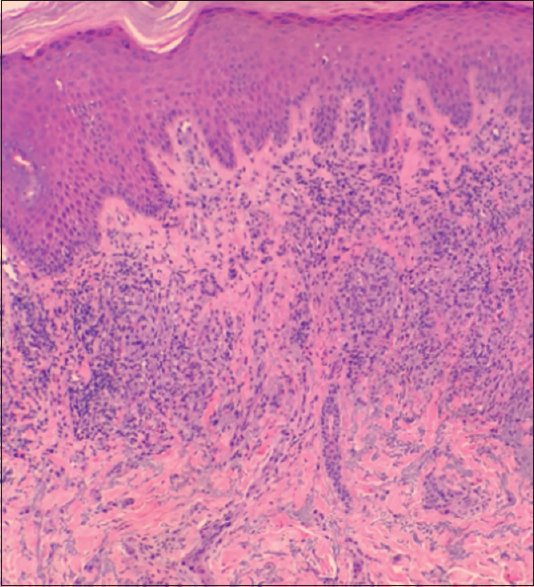 For the left proximal palmar lesion, the biopsy report showed a dense lichenoid, suppurative, and granulomatous dermatitis [Figure 5]. The dermatopathologist was suspicious of a deep fungal or atypical bacterial infection and recommended tissue culture. The patient returned again in 1 month and reported persistent rash. Physical examination revealed tender violaceous verrucous plaques distributed on the right and left distal palmer index fingers. A punch biopsy was done on the skin of the right distal palmar index finger skin and sent for bacterial and fungal tissue culture and sensitivity. No yeast or mold was isolated after 4 weeks. P. agglomerans was isolated on bacterial culture. At a follow-up appointment in 1 month, the patient stated that she had seen some improvement. 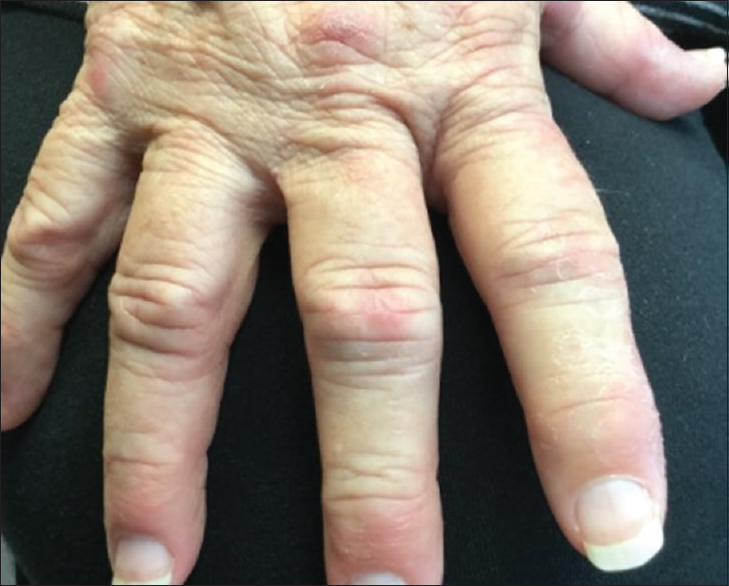 Mild erythema and induration were found distributed across her fingers. The patient was prescribed tetracycline 500-mg capsule twice daily based on the culture sensitivity result [Figure 6]. The patient returned for follow-up appointment in 1 month, and the lesions had resolved. P. agglomerans (formerly named Enterobacter agglomerans) is a Gram-negative aerobic bacilli and member of the Enterobacteriaceae family. The species of the genus Pantoea are commonly found in plants, soil, and feces of humans and animals. Pantoea is primarily an environmental and agricultural organism. However, P. agglomerans is the strain that is most frequently seen in humans and isolated in hospitals. It can infect any organ system in the body, and the severity of infection ranges from nonlife-threatening skin infection to fatal multiorgan system disorders. Cutaneous infection by this organism can occur as a wound superinfection, or the organism may enter the skin with other organic materials when penetrating trauma occurs to the skin. The skin infection could be superficial or deep, for instance, when plant thorns penetrate the skin and remain embedded in the tissues, thereby setting up a chronic inflammatory response. The infection may extend deep into the bones to cause septic arthritis, spondylodiscitis, or tibial osteitis, and it may progress to peritonitis and sepsis. In a recent study done in a community setting, P. agglomerans was isolated from the hands and environment of individuals in households where it might serve as a potential pathogen for either community- or hospital-acquired infections. Similarly, the hands of health-care workers might offer transient carriage for the organism. P. agglomerans is abundantly present in plants, possesses strong allergenic properties, and can cause Type 1 hypersensitivity symptoms in farmers. It can also cause cutaneous late-phase Type 3 hypersensitivity reaction. Moreover, P. agglomerans has some therapeutic benefits in dermatology and other specialties of medicine. The lipopolysaccharide derived from P. agglomerans (IP-PA1) when administered orally or intradermally has been used as an adjunct in the treatment of diseases, including to treat hyperlipidemia, gastric ulcer, and atopic dermatitis, and to prevent and treat infections. IP-PA1 also has an antitumor effect. IP-PA1 may be useful as a supportive drug in melanoma therapy as an adjunct to another chemotherapeutic drug, such as doxorubicin. P. agglomerans is a clinically significant pathogen in dermatology. P. agglomerans not only causes skin infections and hypersensitivity reactions but also can be used as an adjunct in the treatment of malignant and nonmalignant dermatosis. 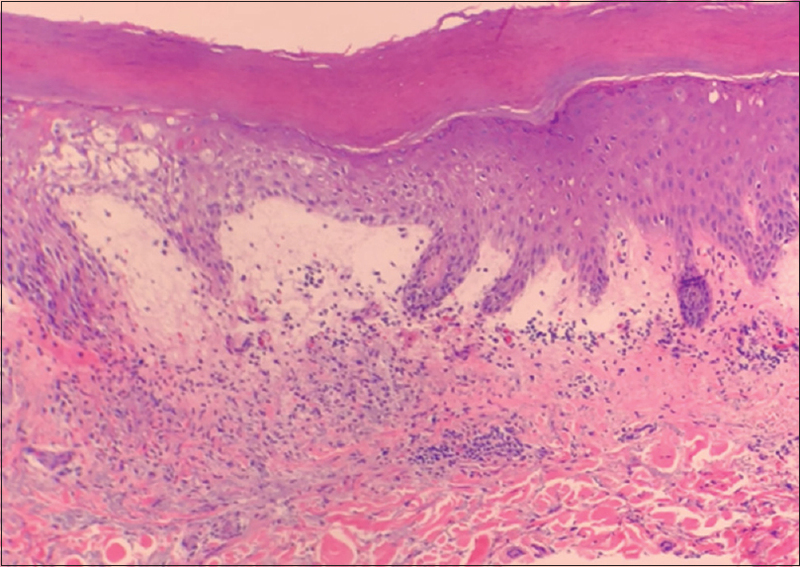 Our patient had an interesting community-acquired case in the setting of HSV skin infection mimicking erythema multiforme and other acral cutaneous eruptions. Owing to the uncommon nature of this infection, especially in the setting of outpatient dermatology practice, it went undiagnosed until a culture was performed. Bacterial culture and sensitivity determined the choice of antibiotics for treatment. Histology is usually nonspecific and may not offer a conclusive diagnosis. Flores Popoca EO, Miranda García M, Romero Figueroa S, Mendoza Medellín A, Sandoval Trujillo H, Silva Rojas HV, et al. Pantoea agglomerans in immunodeficient patients with different respiratory symptoms. ScientificWorld Journal 2012;2012:156827. Dutkiewicz J, Mackiewicz B, Kinga Lemieszek M, Golec M, Milanowski J. Pantoea agglomerans: A mysterious bacterium of evil and good. Part III. Deleterious effects: Infections of humans, animals and plants. Ann Agric Environ Med 2016;23:197-205. Aly NY, Salmeen HN, Lila RA, Nagaraja PA. Pantoea agglomerans bloodstream infection in preterm neonates. Med Princ Pract 2008;17:500-3. Spiewak MR. Risk factors for work-related dermatoses in young farmers. Dermatitis 2003;14:113. Spiewak R, Dutkiewicz J. A farmer's occupational airborne contact dermatitis masqueraded by coexisting rosacea: Delayed diagnosis and legal acknowledgement. Ann Agric Environ Med 2004;11:329-33. Kohchi C, Inagawa H, Nishizawa T, Yamaguchi T, Nagai S, Soma G, et al. Applications of lipopolysaccharide derived from Pantoea agglomerans (IP-PA1) for health care based on macrophage network theory. J Biosci Bioeng 2006;102:485-96. Hebishima T, Matsumoto Y, Watanabe G, Soma G, Kohchi C, Taya K, et al. Oral administration of immunopotentiator from Pantoea agglomerans 1 (IP-PA1) improves the survival of B16 melanoma-inoculated model mice. Exp Anim 2011;60:101-9.